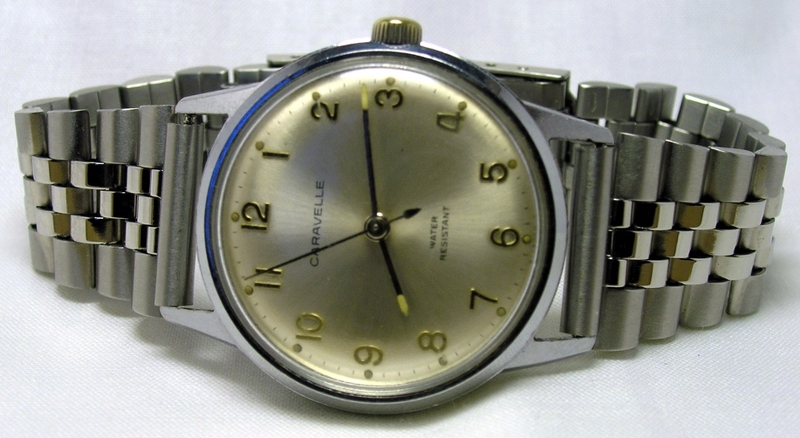 aWhat we have here is a simple, hand wound Caravelle watch (by Bulova) made in 1969. It has a 7 or 17 jewel (probably 17) Citizen made movement. It is a Japan made watch, with Ttritium painted dial. The dial is a subtle, satin finish with Arabic markers. The hands are simple sticks, tipped with luminous material. It is a Japan made watch. At the time, Bulova was trying compete head to head with Timex for the entry level watch market. In fact, this particular watch was originally $9.95, just like Timex. Unlike Timex, this is a partially or fully jeweled movement, not a pin lever movement like Timex’s. The case is quite small at just over 33mm with 17mm lugs. I put it on a jubilee bracelet to give it a 60’s Rolex look. It works quite well. Overall, I do like this watch. It winds easily and keeps excellent time, running about +10 seconds a day, a tribute to Japanese watch makers. Case: 33mm, base metal with chrome plating. Back: Stainless, Marked Caravelle, Water Resistant, Shock Resistant, Anti-Magnetic, Base metal Bezel, Stainless Steel Back. Movement: Hand wound Citizen, Caliber DP11, 7 or 17 jewels, I have not opened the case. Other: Currently on stainless Jubilee bracelet.